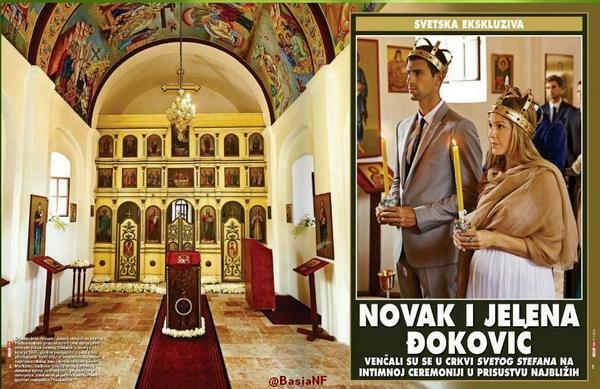 Meet Mr. And Mrs. Novak Djokovic! Just days after wedding longtime girlfriend Jelena Ristic, Novak Djokovic has made his first public statement. Djokovic and Ristic were married last Thursday in Montenegro. The Wimbledon champion is expected to return to tennis next month in Toronto for the Canadian Open. 43 Comments for Meet Mr. And Mrs. Novak Djokovic! It always amazes me when stars say its a private afair,with select guests etc and im not picking on Novak here as many famous people do exactly the same,then they sell the rights to the pictures to Hello magazine for a gazillion dollars/pounds,Jelena looks lovely here so does Novak,and i honestly do hope that they will all be very happy together,but the kitsch of celebrity weddings is all abit too Katy Price OTT at times IMO…. I do realize however that they have donated the money to his foundation,so it is all in a good cause,so well done Novak…. Hippy Chic : You took the words right out of my mouth!!! I thought this exactly : There is nothing “private” about their wedding at all! !Selling their rights to Hello magazine?????? Am I missing something here??????? does not any sense at all!!! Is it just me, or does she have a facial resemblance to Laura Robson? As to the wedding, let’s face it, most folk, if they get the chance, like to show off. People who are plain and unattractive often adopt an eccentric appearance to get noticed, even if not admired. Look at some of the Goths. Or don’t! Loads of money to chairty. No paps and photographers at the wedding or on the night except for the one with the rights. One planned set of photographs for fans, that is clear and not grainy. Seems like win, win, win to me. But of course some will find negatives. Cant wait for American hard courts though. Agree with Jane. Privacy is not necessarily all or none. Just means some limitations and control of the situation but some just want to find negatives. Jane sorry i spoke,i guess im not aloud an opinion evidentally?anyway i agree looking forward to the HC season and back to some tennis,and all the best to Novak and Jelena and baby for the future,and both looked stunning BTW…. Jelena isnt wearing any make-up in that top picture,and she is very naturally beautiful and doesnt need it,a refreshing change from the women celebrities who usually wear that much they have to remove it with a trowel…. Hi, Hippy Chic. Nobody is disallowing you to have an opinion. Jane was just giving her opinion to your opinion. This is an open forum anyway. And to Anna who’s misising something, read Jonathan’s comment at 1:18. Sorry Jane no harm or foul or anything…. Sorry and hi Polo too :))…. Hippy Chic, like you I can’t wait for the US Open but I haven’t decided who to root for (that’s if Federer won’t be it). It’s definitely not one of the upcoming players. Maybe Ferrer but that’s like barking at the moon. Q: I heard you say that you stopped wearing makeup on court. Is that right? Polo im sentimental so i think it would be fantastic for Ferrer to win a GS,and he made the final of the FO so you never know,but a tall order i would think?one of the nicest guys on tour too,and our pyschic friend has said it will be either Federer or Wawrinka,Rafas my favorite 1st then Murray,and i do think it would be lovely to see Murray get back into the winners circle again,or fantastic to see somebody new Raonic,Dimitrov,Nicky.K,Nishikori etc etc, i really like Nisikori and i hope for good things for him,and it looks like Tomic is finally begining to take tennis seriously,exciting times ahead…. Jonathan the only time i wear make-up is when im going for a night out,and ive had my husband and one or two friends male and female say to me you look nice,but you dont need to wear make-up,to which i reply thankyou but it just makes me feel better about myself…. Unfortunatly i will miss the second week of the USO,as i will be away at a camp celebrating the Autumn Equinox…. @Colin – now that you mention it, I can see the resemblance in the wedding pic above. I think it’s the facial expression. RZ yeah me too,both are very pretty anyway…. I can’t wait to see the bambino…regarding makeup….very very few women can go without it, imo. I wouldn’t be caught dead without my war paint…..definitely is better for everyone around me if I wear it!! LOL Looking forward to USO too, but will be tuned in for Montreal and Cincy whenever. Hugging Mr. and Mrs Djokovic back from tennis-x. NoleFam all the way ! I myself am hopefully getting married again within the next couple of years,to the same man…. This may explain why Federer won’t be retiring soon. He works hard at staying at the top and makes it worthwhile for his sponsors. He is so good that even at his age, only a handful (not even one handful) of athletes much younger can beat him. And the guy looks classy and well spoken. A great athlete and person, a sponsor’s dream. There won’t be another one like him for a long long time. Of the upcoming players, the one I hope to win a majors first is Raonic. He seems like a nice guy (except for the net cord incident with del Potro for which he subsequently apologized), works hard and plays straightforward tennis with no irritating behavior. Polo, indeed the “Federer brand” is something never seen in tennis before no wonder he is the number 1 sportsman right now. The more he plays the more he solidify his status. It’s like these days when you say to somebody you hardly knew you like tennis and they immediately say Federer, the aura effect. I agree in that Roger is the best and probably the most branded tennis player ever,and ONE of THEE best sportsmen ever,but i always think things get a touch OTT when people say THEE best/most popular overall sportsperson ever,if tennis happens to be ones favorite sport and Federer your favorite player,then i suppose its only natural for people to say that,but there are many sportmen/women whom are very popular in their own fields of sport Bolt,Phelps,Farar,Sir Steve Redgrave(5 consecutive gold medals),Thompson etc,cant we just have best ever tennis player,and one of the best ever sports men/women and leave it at that,im not a hater,but surely the fawning gets too much sometimes IMO? Such a slow time in tennis ATM,that its a shame tennis isnt part of the Commonweath games like the Olympics is IMO…. And Federer is a very effective in whatever product he pitches. His name is tightly associated with the products. If you do a word association naming a celebrity after a product, e.g Rolex, Moet Chandon, Lindt Chocolate, Federer is the name that would come up most frequently. And that’s why he gets to big bucks from those companies. Not surprised “the old one” is still hanging around the sport instead of hanging up his racquets. One would think with 4 kids now he would be glad to give his old bones a rest and spend some quality time with the little ones. It’s all about the big $$$$$$. He will milk it as long as he can. Hippy Chic, it is not fawning but rather a statement of fact that Roger Federer, in a tie with Tiger Woods, gets the highest endorsement deals of all the athletes in all fields. Both got $65M in endorsement deals in 2013. Polo fair enough,its just something i find a bit OTT,most popular this most popular that etc,i just dont understand why they dont all get credit in their own areas of greatness…. Great post and link. Thanks. The man stands alone. He wouldn’t be getting all these endorsements if he they didn’t think he is one of the most marketable athletes on the Planet. You’ve got to hand it to Mr. Djokovic for doing the right thing — marrying the gal he knocked up. The man has integrity. he’s not the only one with integrity-fed and bagdatis have it too! I’ve always had a soft spot for Jelena. What a cute couple congratulations on the many many joys they are celebrating right now ! Peep and M.J Novaks beens with Jelena 8 years,and Roger and Mirka were together along time too,they are couples who i would think are obviously very much in love,nothing to do with marrying because their girlfriends being pregnant,please try not to be so cynical…. I just read the beautiful spread about Novak and Jelena’s wedding, in Hello magazine. Congratulations to Novak and Jelena, and may they have many, many happy years together and with children and families. We look forward to watching Novak play in Canada in the Rogers Tennis Tournament, coming up in August 2014. Yes a great looking couple and at a great time in Nole’s life. Best success to their lives together and Nole’s 2014 as NUMBER 1 in the world over all others in their prime.